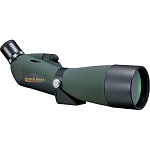 Vixen's entry-level scope, the Geoma II 25x52 Spotting Scope, is a collapsing-body model that's perfect for casual observing from a monopod, car window mount, or even hand-held upon occasion. 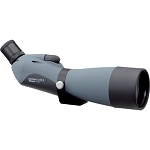 There's an optional zoom lens (a small 25x eyepiece is standard), and the body has a unique portal which will hold your eyepiece not in use. 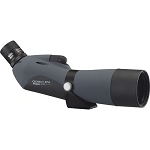 This scope is so cute that it is unthreatening to newbies, and can be a good secondary device to use (with your binocular as your main stable entry) on a wildlife observing excursion. 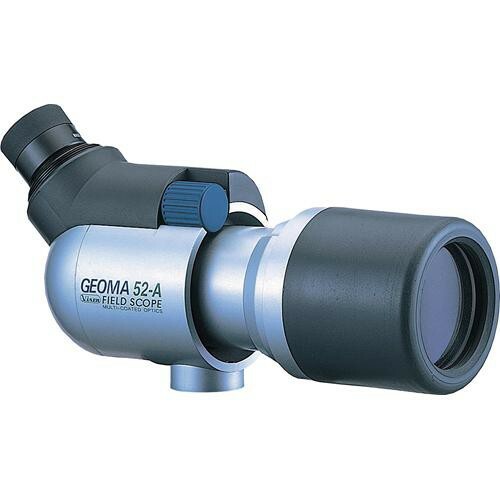 This is the angled viewing version of the Geoma II 52; a straight-through viewing model's also available. Most users will prefer observing through an angled model, but the straight viewing models require less experience to find your subject. 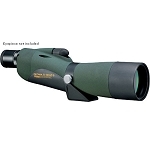 Angled scopes are easily shared in a group; a straight viewing scope is difficult to share. 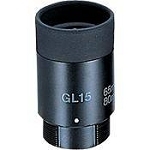 If observing from an elevated position, a straight viewing model's preferable.